March 2016 – Paso Robles, CA – On the heels of winning several awards from the San Francisco Chronicle Wine Competition and being named the Monterey Winery of the Year under the USA Individual Awards handed down by the New York International Wine Competition the much anticipated new releases from Mystic Hills Vineyard are here. 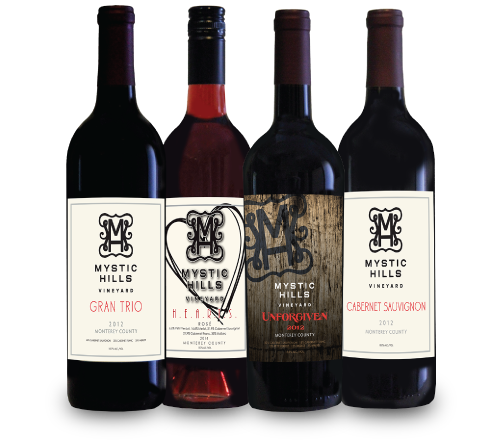 The San Francisco Chronicle Wine Competition 2015 awarded Mystic Hills Vineyard’s 2011 Unforgiven red blend a Gold Medal, and both the 2011 Sequel red blend and 2011 Cabernet Sauvignon received Silver Medals. These awards, along with several others, were handed down to every wine Mystic Hills Vineyard has produced. Vintner Joel Cox is not a stranger to being honored with awards, he is an Oscar winning film editor. Some of Mystic Hills Vineyard wines are named to honor his decades-long career as Clint Eastwood’s editor. “Our grapes are hand-picked and sorted by each varietal and our wines spend more than two years in oak barrels to ensure consistent balance and character.” said vintner and co-owner Judy Cox. New releases include the highly awaited 2012 Unforgiven Bordeaux blend of Cabernet Sauvignon, Cabernet Franc, Petit Verdot, Merlot and Malbec; 2012 Cabernet Sauvignon 100% Cabernet; 2012 “Gran Trio” Bordeaux blend of Cabernet Sauvignon, Cabernet Franc and Merlot; and the 2014 H.E.A.R.T.S Rosé of Cabernet Sauvignon, Cabernet Franc, Malbec, Merlot and Petite Verdot. Wine lovers in the Santa Clarita valley can drink these wines at Wine 661 or The Paseo Club of Valencia. They are also invited to attend the H.E.A.R.T.S Rosé release party at Salt Creek Grille Valencia on April 16 and Wine in the Pines on June 11.